Size of this preview: 800 × 585 pixels. Other resolutions: 320 × 234 pixels | 640 × 468 pixels | 1,024 × 749 pixels | 1,185 × 867 pixels. 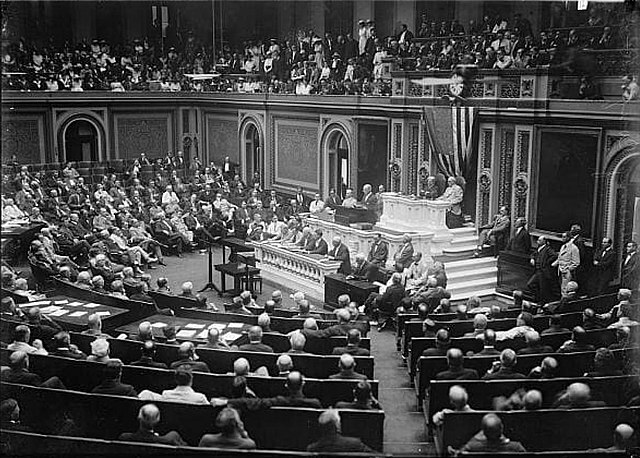 English: President Wilson before Congress, announcing the break in the official relations with Germany. February 3, 1917. Author Photograph by Harris & Ewing. current 04:25, 12 January 2013 1,185 × 867 (523 KB) Creysmon07 Light and contrast corrections.